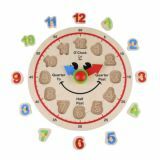 Time after time, kids will use this multi-tasking clock to practice hours and minutes, as well as numbers and colors. Identify the "big hand" and "little hand." Look for them on other clocks. Move the clock to show what time kids wake up, eat lunch, and go to bed. Start talking about hours and half hours. Then add in minutes. Age: 3+ Years. L: 30, W: 30, H: 3.6 inch.